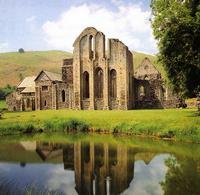 The evocative ruins of Valle Crucis lie in green fields beneath Llangollan's steep-sided mountains. In medieval times, this was a remote spot (ideal for the austere Cistercian monks, who deliberately sought out wild and lonely places). Their abbey, founded in the 13th century and added to a century later, has fared better than many of its contemporaries against the ravages of time, history and neglect. Many original features remain, including the glorious west front complete with an elaborate, richly carved doorway, beautiful rose window and 14th century inscription "Abbot Adam carried out this work; may he rest in peace. Amen". Other well preserved features include the east end of the abbey (which still overlooks the monks' original fishpond) and the lovely chapter house with its striking rib-vaulted roof. Valle Crucis is not just a lesson in medieval ecclesiastical architecture. A visit to this fascinating site evokes the lives of the Cistercian monks, successful sheep farmers and enthusiastic supporters of Welsh culture as well as devout men of religion. Interestingly, Valle Crucis also reveals a gradual relaxation in the strict regime of the Cistercians. By the late 15th century, the abbot decided to build for himself a fine new hall with a heated private apartment. Valle Crucis, the "Valley of the Cross", is named after Eliseg's Pillar, a 9th century Christian memorial cross which stands nearby. On A542 from Llangollen, approx 3km/2mls on RHS.